An out of turn Gridman instantly had me thinking about today which covers quite a few occasions. Having subsequently tackled the puzzle, I wonder if TH has jumped the gun and published this two weeks too early since Children's Day is Nov 14. In any case the puzzle itself has all of Gridman's characteristic style and it it very impressive that he has managed to work a C into each across clue. Favourites : ADOLESCENT, WAIF and NEATO. 4 Stirred with strong emotion by part of modern edition (5) ERNED [T] ? 8 Not going back to agitated giant for scoring music (8) NOTATING [NOT + GIANT*] not not going back? 17 Big fix in military lockup (4) BRIG [Big + fix=RIG] Big=B? 8 down...not is not going back? 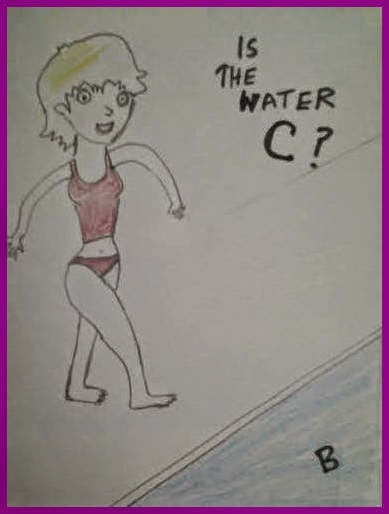 Felt like diving into C(old) water- just like CGB's cartoon,while trying to tackle the C letter. I had to try quite a few clues until it dawned on me. Like it was stated, today not being Children's day did not help. Is it a new Children's day declared by Namo? Though I had a few blanks felt satisfied to have tackled (took it on the chin?) and fared fairly well in this toughie.I learned about 'Canthus' from a comment by CV long ago- came in handy today.I remember he had also mentioned 'Exocanthus' being the outer end. Thanks to computer- I had saved it! Expected more comments on seeing this unusual CW- looks like Saturday effect. No Saturday effect. Had to struggle a bit with a couple of clues in both South-East and North-West corners. Could manage 80% only but I liked this puzzle for its variety! Curiously, both the clues use 'a couple of females' and even rhyme with each other. But I personally like Gridman's clue better. Because, as reported earlier, in the ET clue Man=RAY. As I said earlier, when WP leads to a name which is defined as boy/girl/man/woman, I think it is ok. But I am not too happy when in the wp man becomes some name. Agreed. Only that there's this connector 'for' before light, which carries no meaning. In some species of glowworms only the females give light to attract the males. And males are getting confused by the street lights and leaving the females disappointed. Call them Dumb or Blind males!? Nothing fits 4D except ERNED as [T], but that's no word. Apart from the few reservations already mentioned by others, this was a fairly smooth grid with some nice surfaces. Missed only the two 17s. Fishing gear is reel or reels? It's an interesting clue in that both 'fish' and 'gear' are referring to plural forms of words. Govt of Karnataka has announced a compensation of Rs.9000/hactare for onion growers who lost their crops due to excessive rain. At about 10 sq ft, I am eligible for a princely compensation of 83 paise! How many onion saplings did you plant in that patch? Now I know how this man knows his onions. Privy purse? Then you will be due to give us a treat! You might be privy to the info that it costs at least one rupee to use a paid privy. The COO there might ask me to stop early if hand over the amount of compensation. By the way, I will not be parting with my sub-rupee coins to him.